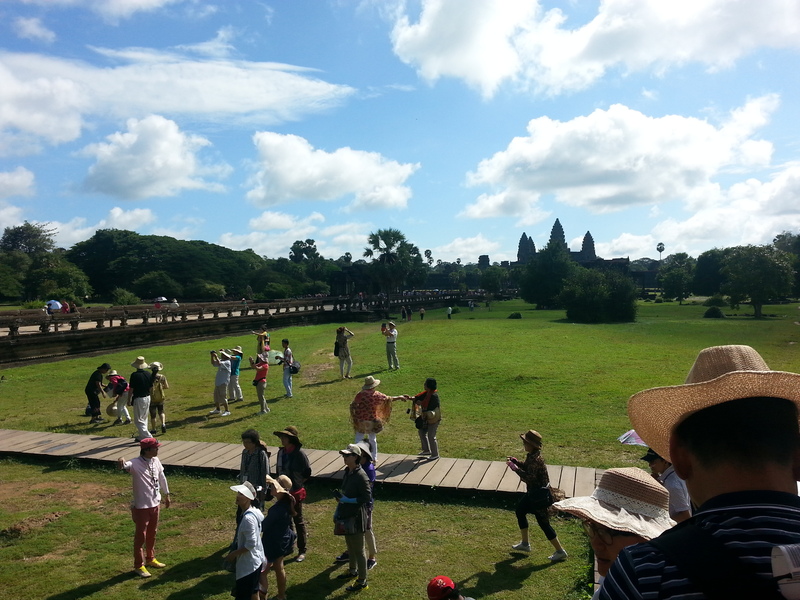 We begin our journey to Angkor Wat complex at 8am , intending to complete the Small circuit. There are 2 types of circuit. The Small Circuit takes in several of the major temples around the area while Grand Circuit is an extension on the little circuit but covering more temples and places and is highly recommended for anyone spending three or more days in the complex. 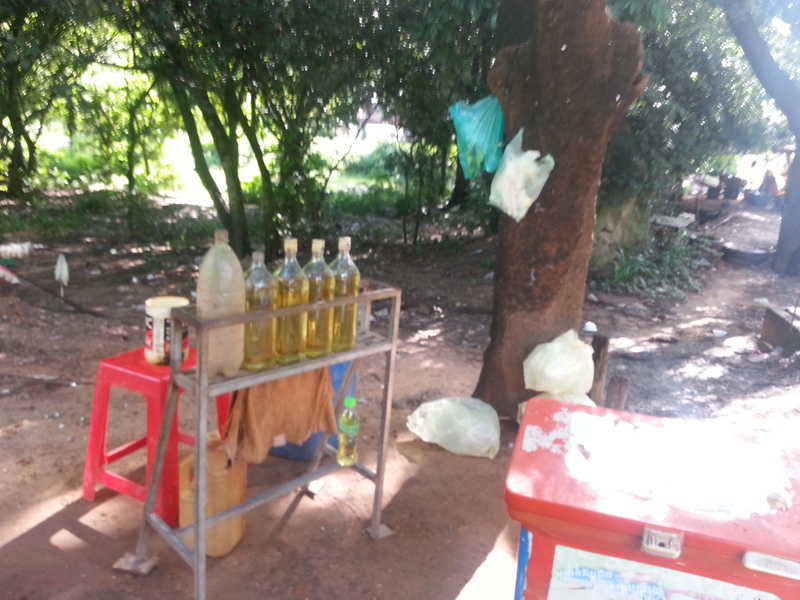 As we only stay in Siem Reap for 2 full days, we chose the small circuit. This is where the Tuktuk fill in their petrol. Easy right ? Our mode of transport was tuktuk. After lengthy negotiations the night before, the tuktuk driver agree to bring us around small circuit for USD15 plus the sunset view. If u have only one day, its better to take tuktuk rather than renting the bicycle, as the place was huge! it will drag your time trust me. But if u have the three days pass, then go for bicycle. It only cost u 1USD per day. 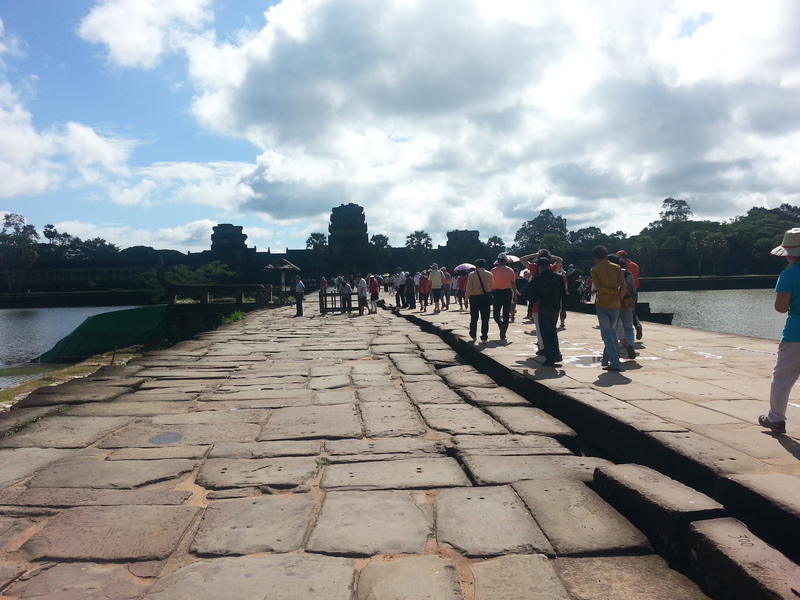 The distance from central Siem Reap to Angkor Wat complex entrance is about 8km. The fee for one day pass is 20USD. 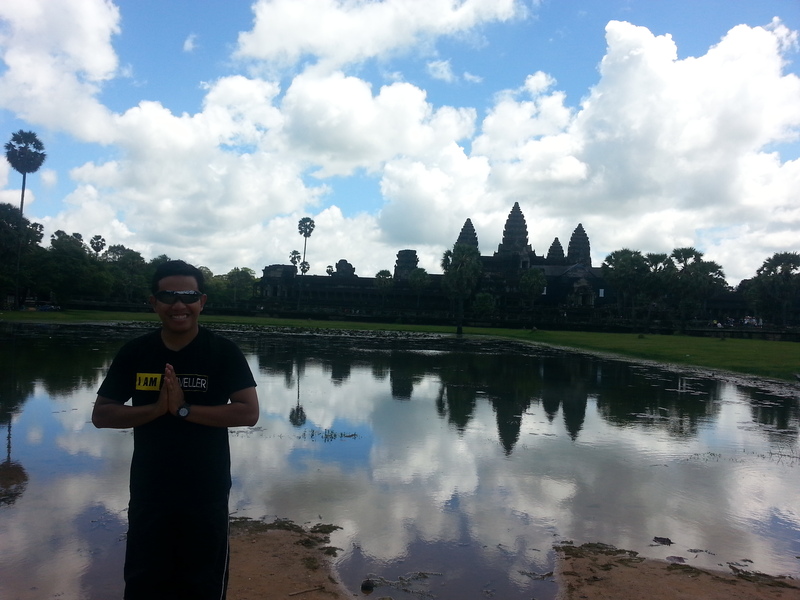 Our first stop was the Angkor Wat temple. This is the main temple of the Angkor Wat complex. 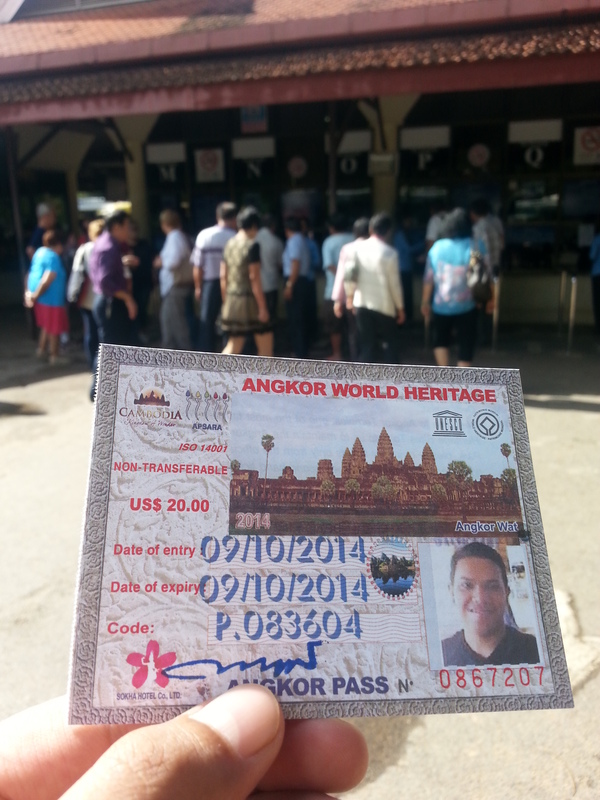 Angkor Wat literally means “City of Temple“. It is a Hindu temple built by King Suryavarman. We hired a licensed tour guide to guide us and explain about this marvellous architecture. We pay 10USD for that services. It is highly recommended to do so because it would be a great waste if u just come there to take pictures and not knowing the treasure behind the construction of this temple, For me, the essence of travelling is to know other cultures and history and not just sightseeing. Try to haggle the price because there are tour guides who tried to charged USD15 per head ! in that case, just let it go, and find other tour guide. But dont haggle too much too. Be reasonable. 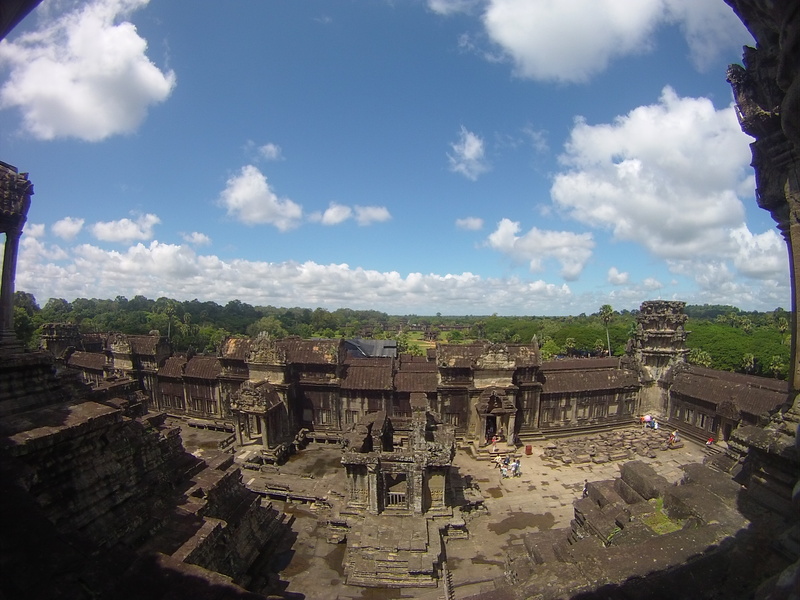 The Angkor Wat temple is very huge and it takes us 2 1/2 hours to fully explore that temple. It has three main part and the last part u reach will be the “heaven” part. As we stroll around the temple , the tour guide explained us about the unique history of Angkor empire and the meaning of the symbol inside the temple. One interesting fact, the Ayutthaya city in Thailand use to be under the kingdom, and the people associate themselves as khmer people. After Angkor Wat Temple, we had our lunch in one of the restaurant along the journey. The price is quite expensive though and i suggest those who want to have lunch to pack their own. Then we progress to the next temple in the small circuit. For every temple , there will be people selling stuff and dont say anything to them unless u want to buy anything, or else they will wait u to finish and force u to buy something. In one of the temples that we visit, there are people who performing traditional khmer music and most of them are the victims of Pol Pot regime. The music was nice and I decided to give some token as appreciation. One more thing, I regretted that I did not buy some of their drawings. It was cheap and beautiful. U can scroll it and put it into your backpack. The last temple we visit for the day is the Angkor Thom complex. It comprises of several temples, the famous one is the Bayon Temple. Built in the latter part of the 12th century by King Jayavarman VII, Bayon is one of the most widely recognised temples in Siem Reap because of the giant stone faces that adorn the towers of Bayon. There are 54 towers of four faces each, totalling 216 faces. However before we reach there, suddenly there was super heavy rain and we had to take cover in a small hut with Buddha statue and people praying. I feel very awkward at that time with my wet clothes. haha. The rain lasted for about 45 minutes and after that me and my colleague continue to explore the complex. Due to the rain, we missed our sunset as the entrance to the sunset view spot is only open untill 5.30pm. We reach our hostel at 6.30pm. For the night activities, we explore the Pub Street and had our dinner at stalls along the street. I prefer to eat there as I can see they way they prepare the food and ensure it is halal. Besides that, the taste is nice and the price is cheap. The juice stall is highly recommended as it is fresh and tasty.